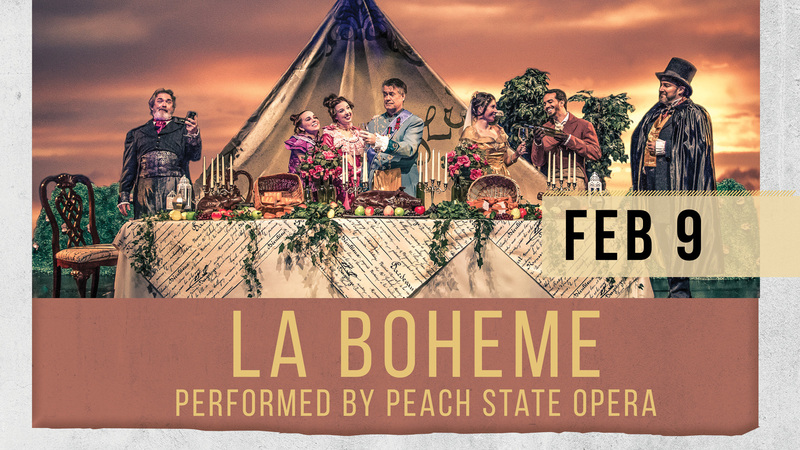 Performed by Peach State Opera and accompanied by local vocalists, La Bohème, is a passionate, timeless and indelible story of love among young artists in Paris. The opera can stake its claim as the world’s most popular opera. It has a marvelous ability to make a powerful first impression and to reveal unsuspected treasures after dozens of hearings. 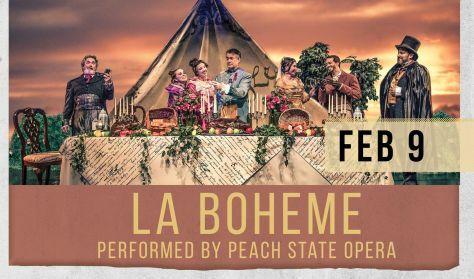 At first glance, La Bohème is the definitive depiction of the joys and sorrows of love and loss. On closer inspection, it reveals the deep emotional significance hidden in the trivial things—a bonnet, an old overcoat, a chance meeting with a neighbor—that make up our everyday lives. La Bohème was composed by Giacomo Puccini. The opera contains some of the mostmemorable arias and musical scenes in opera. Throughout, Puccini relies on short musical motifs that represent characters, themes and moods so that the music underscores and highlights aspects of the drama. In the case of Mimì and Rodolfo, musical phrases bring the opera full circle and let the music reveal the memories recurring in the minds of the lovers as they say farewell. It is the perfect outing for a Valentine’s treat.